Red Fox guesthouse is a family owned and run brand new boutique B&B in the center of Old Tbilisi, Georgia. The guesthouse is defined by it's homely atmosphere and a personalized service to the guests. 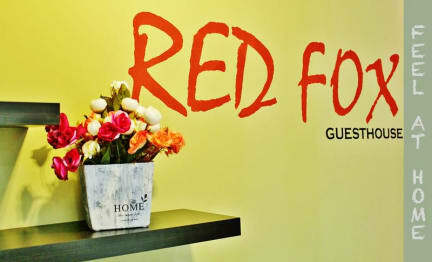 Red Fox guesthouse features vast of space throughout it's modern interior, defined with plenty of Art Deco elements, which creates the essential boutique feel. The guesthouse has 12 rooms: 2 Large Twin rooms, 3 Large Double rooms and 5 Single rooms, all with the shared bathroom facilities. Also there are 2 En-suite rooms: Double En-suite and Triple En-suite. Property comprises bar/kitchen (the choice of either Continental or English breakfasts is included in the room rate), shared bathrooms as well as En-suites (the towels and toiletries are provided free), daily housekeeping service, free Wi-Fi, satellite tv in a lounge area, the outdoor patio for smoking and bicycle parking purposes, free tea/coffee making facilities at the bar/kitchen area. The few unique points about my guesthouse are first of all it's central location (situated in the heart of Old Tbilisi, all the city's landmarks are within the walking distance), the homely environment achieved by the distinguished interior design, the new amenities and appliances featured throughout. 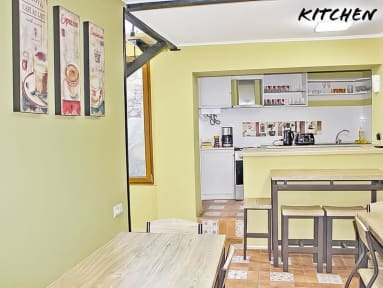 The hefty breakfast served in the morning, clean rooms and bathroom facilities, a satellite tv and free wifi in a lounge, tea/coffee making facilities in the common kitchen, a designated smoking area at the patio. Check in from 13:00. The latest check in time depends on a time advised by a guest beforehand. Check out from 11:00. The latest check out time depends on a time advised by a guest beforehand. The reception desk is not opened all day, but during the period of check in/check out, which will be a time gap from 11am to 2 pm. Payment upon arrival by cash (Georgian Lari), credit cards, debit cards. Red Fox guesthouse is a family run B&B, therefore is defined with the limited check in/out hours. We do strongly advise our future guests to let us know of their arrival times earlier. The guests will be given two keys after the check in, one from the room and another from the main doors, as well as WiFi password.